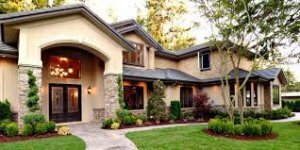 Ramping Up Your Home’s Curb Appeal. So, how to achieve it? Read on for some of the best ideas from the pros. * Addresses aren’t just for mailboxes. You’ll score points for originality by painting each numeral -; in big, bold strokes -; on separate flower-filled planters placed near the front entrance. “You spruce up your landscape with plants, so why not liven your home address the same way?” suggests Angie’s List. * Replace your roof. This is the biggie, given Better Homes and Garden’s oft-cited calculation that 40 percent of a home’s curb appeal hinges on the condition of the roof. Now, you may be only slightly embarrassed by your neighbors’ not-so-subtle hints that yours looks like it’s been hit by a drone. But if you’re even toying with the idea of selling and that’s the first thing potential buyers see from a distance? “It’s a huge turn-off, and only makes them predisposed to find even more things they hate about the house,” says Patsy O’Neill, a sales associate with Sotheby’s in Montclair, New Jersey. The fix? Jason Joplin, program manager of the Center for the Advancement of Roofing Excellence, is just out with a glowing review of the gorgeous new line of Glenwood Shingles from GAF, North America’s largest roofing manufacturer (gaf.com). “It’s the industry’s thickest triple-layer asphalt shingle,” he says. “Not only does that result in an authentic wood-shake look at a fraction of the cost of traditional wood shake, but you’re also getting enhanced fire safety and lower maintenance.” And, hey, you’re also doing your part for the environment. “Michael and his team really put out a great product and the returns they give with their properties are insane. I bought 4 properties from Steward Holdings Group 2 years ago and I still have the same tenants as when I bought the homes and I am still collecting an average of $4,800 per month on each location. The rental model Michael has designed is second to none. I have never gotten returns like this from any of my properties in the past and to top it off the design and layout they did with the renovation is amazing. Keep up the great work Michael. I will be calling you back in a few months for my next rental”. “Steward Holdings is an amazing organization that does amazing work with their housing programs. Not only do they provide a beautiful place for people to live but they also go above and beyond with their customer service. We have worked with Steward Holdings for sometime now and they have also been professional, courteous and they also put the client first. I have seen some of the properties that they have taken from completely distressed to completely transformed into amazing gems that really beautify the neighborhood. I have had several staff members who have bought homes from Steward Holdings and they still admire the craftsmanship to this day and the housing they provide for the clients we refer over are some of the most beautiful housing locations in NYC, both inside and out. Keep up the amazing work Michael”. “Steward Holdings has been in partnership with Essen Health Care since February of this year. We have had nothing but positive experiences with the organization and have successfully housed a number of our patients in their sites. As the Administrator of Essen Health Care’s Care Management program, I work with a large number partners and community based organizations. The level of feedback, communication, and attention to each client at Steward Holdings is superior. Steward Holdings goes above and beyond for its clients and offers quality support and services in an efficient manner. I cannot recommend Michael and his team any higher. What Are The Expenses Associated With House Flipping In Westchester ?